After four consecutive years of federal budget deficits totaling more than $1 trillion annually, the nation’s finances have improved with employment gains and increased tax receipts. In fact, for FY2014, the annual budget deficit came in at slightly less than half of a trillion, at $483 billion. Additionally, the Congressional Budget Office is projecting continued improvement over the next two years. But the budget stewards believe it’s a temporary respite, and that the risk of higher taxes in the future is undeniable. Beginning in 2017, and especially in 2018, the budget picture worsens substantially. 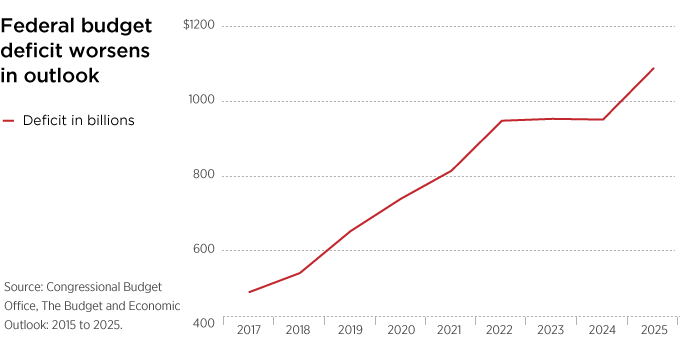 Under current projections the deficit is expected to increase to $739 billion by 2020 and to exceed $1 trillion by 2025. What is driving future deficits higher? There are three key factors fueling this projected spike in the deficit. 1. Interest rates. Interest rates are expected to eventually rise, which will dramatically increase the interest owed on expected borrowing — from $229 billion in 2014 to $548 billion by 2020 and eventually over $800 billion by 2025. Another view of the trend is to consider net interest spending, a metric that is currently 1.3% of GDP and is projected to rise to 3% of GDP by 2025. 2. Social Security. As the population ages and more baby boomers file for retirement benefits, a growing share of the federal budget will be needed to provide those benefits. Social Security spending is currently 4.9% of GDP and is expected to increase to 5.7% of GDP by 2025. 3. Health-care spending. Similar to Social Security, expenditures for Medicare will increase significantly as more baby boomers retire. There are also new costs associated with the Affordable Care Act, which currently provides subsidies to more than 10 million Americans to help them purchase insurance via the health-care exchanges. Spending for health-care is projected to outpace Social Security over the next decade. Current federal health-care spending is 5.1% of GDP, and the CBO expects that to grow to above 6% by 2025. Of course, these projections are subject to change with economic conditions or policy changes. Members of Congress have discussed reforming mandatory government programs in ways that could improve future budget projections. But these proposals may include higher taxes, reduced benefits or, most likely, a combination of both. Investors should consult with their financial advisor today on a savings and investment plan that will help them meet the challenges of these risks in the future.